I remember it like yesterday: 2004, when Ford was in the midst of its retro spree, showing off a gleaming, aluminum-skin look of the future. 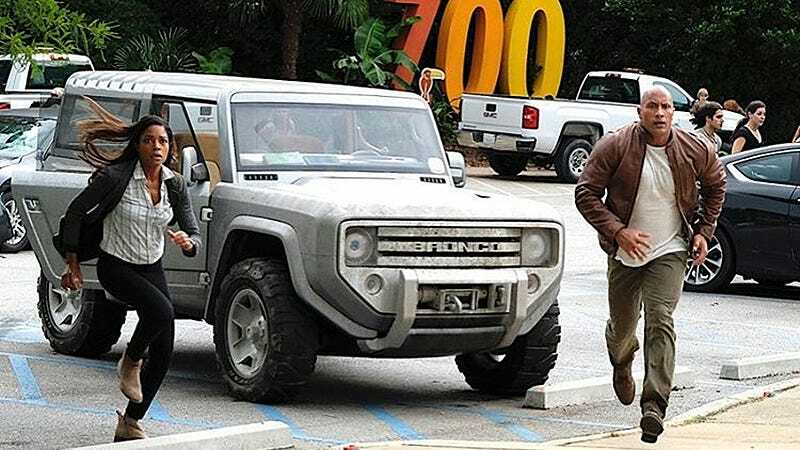 It was the Bronco concept, and the world needed it. But we’ve been waiting. It’s been 12 long years now that I have dreamed about this perfect little two-door SUV and now we’re seeing it make the light of day once more, even if it is on set for some movie. The heartening thing is that The Rock has an official link up with Ford, and Ford last used The Rock to debut the 2018 Mustang refresh. What I mean to say is that things could be happening here. Official things. Moreover, Ford has confirmed that the Bronco is coming back in one way shape or form. What’s exciting here is they’re again referencing this classic 2005 look. Could the production car look like this? I’m afraid to hope. My heart is too tender. Is The Rock Too Big For This LaFerrari? No. The Ferrari Is Too Small.